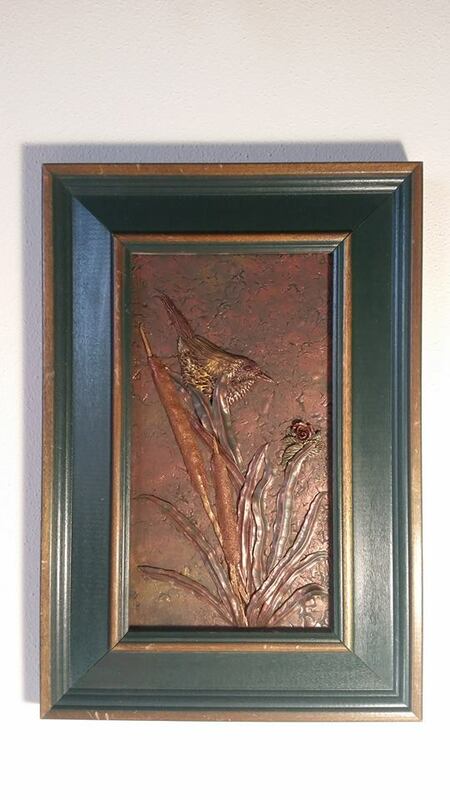 A bas relief piece that currently lives with my grandma an’ ‘em. 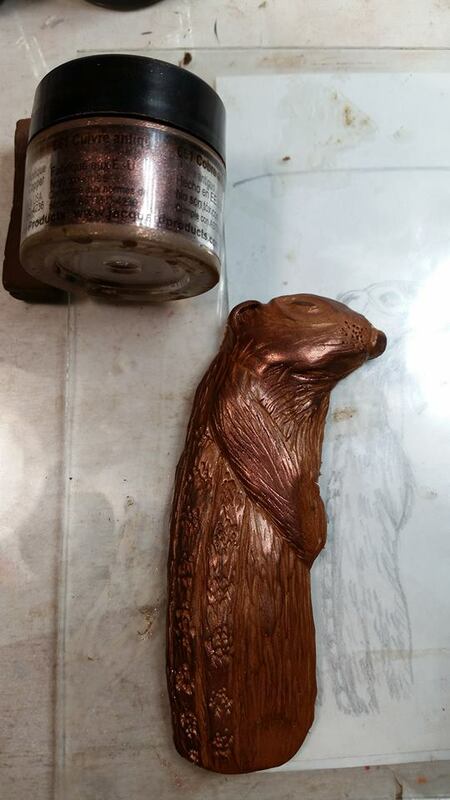 To get the tutorial wheel rolling again, I’ll do a quick walk-through on a fast and simple bas relief method that can be accomplished with a few simple tools. 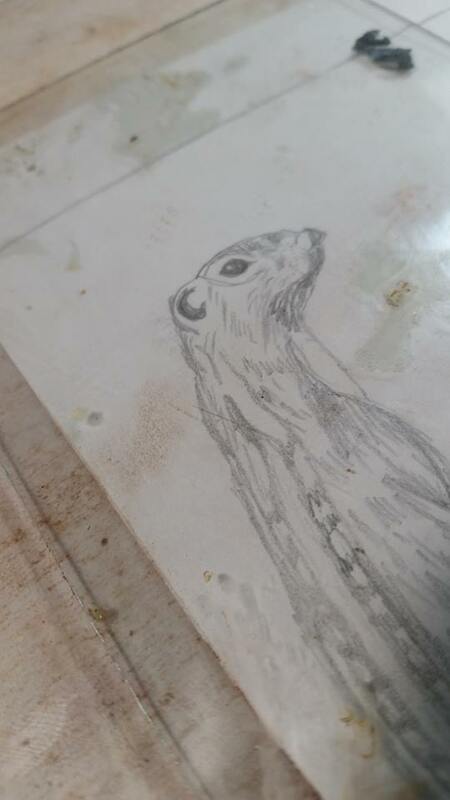 The chipmunk that I’m making this time will be one of several animals in a larger piece, and it will be partially obscured by vines and leaves. I’ve chosen bas relief for these animals for two reasons. I wanted detail without too much bulk, and I want to have more of a sense of critters peeking out from behind the foliage than to have them as the focal points. I have recently used bas relief for a focal point element and was thoroughly underwhelmed with my finished product, but I expect a different outcome with this project. The flatter images will give me room to do the extra layering that I’m counting on to make it work. I started with a photograph that I took in June of 2017. I sized it appropriately, traced the outline, then filled in details. During this process, I thought about the 3D shapes that I wanted to enhance in the clay version. If you do not do a sketch, take time to consider your photo. You will need at least one flat glass plate (I use two), conditioned polymer clay, a sketch or photo, craft knife, sculpting tools,a tissue blade, chalk pastel, and corresponding shades of mica powders. If you’re adding this to pre-baked clay, you’ll also need liquid clay for adhesive. I used two pieces of glass from old picture frames — 8x10 over the drawing as a base and 5x7 on top of that, which is my work surface. This made it easy to move the small piece of glass around as I checked my sculpting against the details of the sketch. Form clay into the general shape that you need. Using the sketch as a guide, roughly shape basic body parts with your fingers. Press down around all of the edges to give a rounded look to your shape. 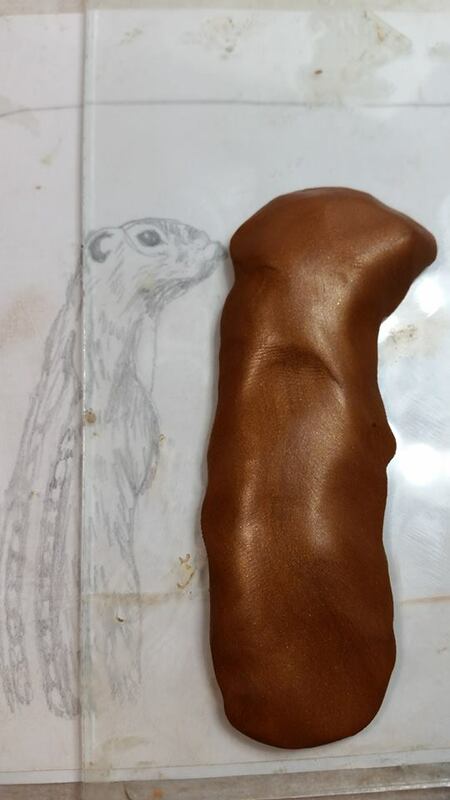 Using a craft knife, cut away excess clay until you can just start to see the edges of your reference picture. Gently round out all of the edges and smooth away fingerprints. Using appropriate tools, create definition of main features. Check your work against your reference picture. With detail tools, add fine lines. Use chalk pastel of a darker tone to add depth to recessed areas and other dark areas. Starting with the darkest mica powder and going to the lightest, use your fingers to add layers of color that correspond to the main light and dark areas on the reference photo. Using a cotton swab or small sculpting tool, add mica highlights and spots of color. When you are satisfied, use a tissue blade to loosen your work from the glass. If this will be added to pre-baked clay or if you will not be able to use much pressure to secure it to raw clay, use liquid clay as an adhesive. As always, bake according to the manufacturer’s instructions. This is the third critter in this piece for me. The first two were birds. I find the nuances of beak shape challenging, but it’s making for a lot of expressiveness in their faces. I’ll be writing about another bas relief method in coming days. I recently used it to create an entry for the first zine in which I’m participating. More on that soon!